TC Muzzleloader, 70 yard shot, 300 yard recovery. Congrat's Will from Prairie Images! 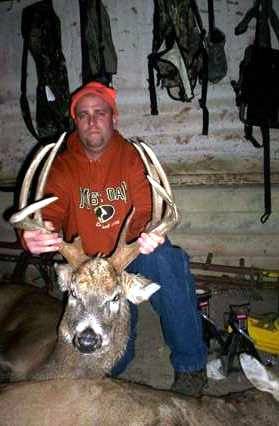 That is a fine Iowa whitetail. I lose sight of the arrow immediately but hear the good slicing sound. The deer crashes away into the marsh and I see the cornstalks moving against the sky briefly on the other side of the marsh. Blood is found immediately and the buck went maybe 60 yards tops, barely making it to the corn on the other side. Double-lung pass through with the Woodsman head. Good blood trail. 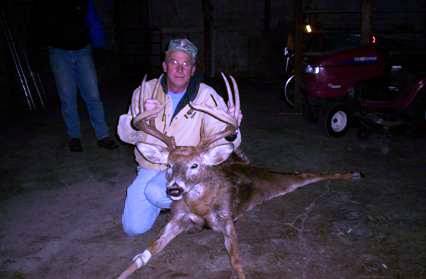 He was exactly what I thought he was, maybe a 127" gross 4x5, pretty heavy mass on bases for a 3.5 year old in these parts, very good brow tines, and will make a nice skull mount. (The cape is freaking awesome and I saved it). 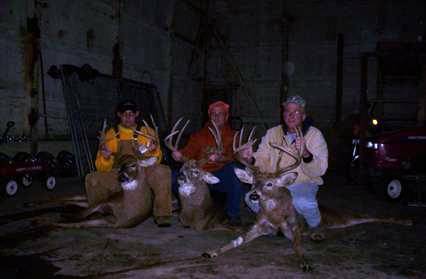 It WAS a spectacular hunt and I'm very happy to punch Nebraska tag No. 1 with him. It had to be my new Sitka Gear, right? 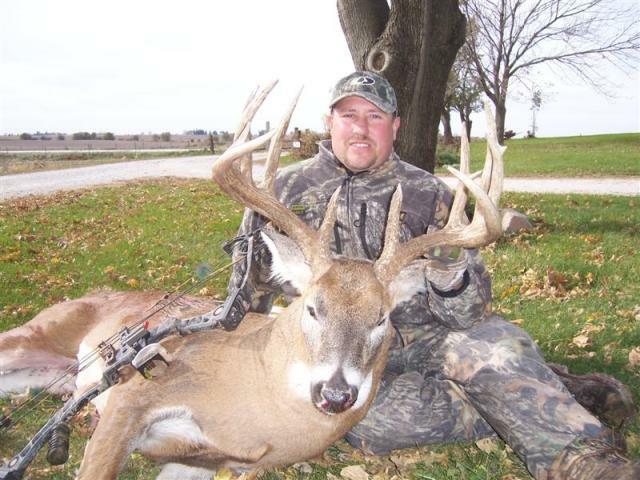 Minnesota hunter, Tony Godlewski, took this old Iowa ten point buck on October 29th. 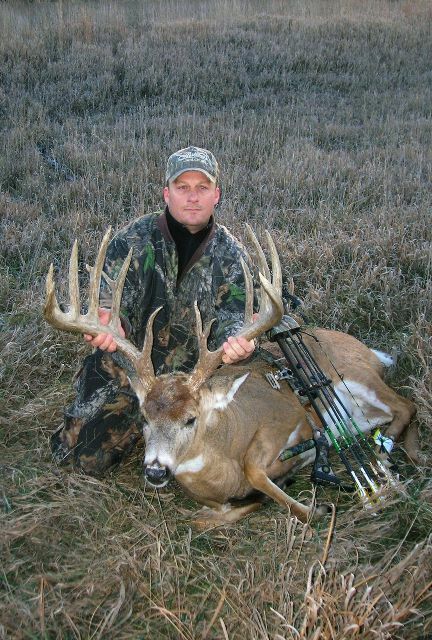 Great mass some stickers and a nice droptine make him a great trophy. 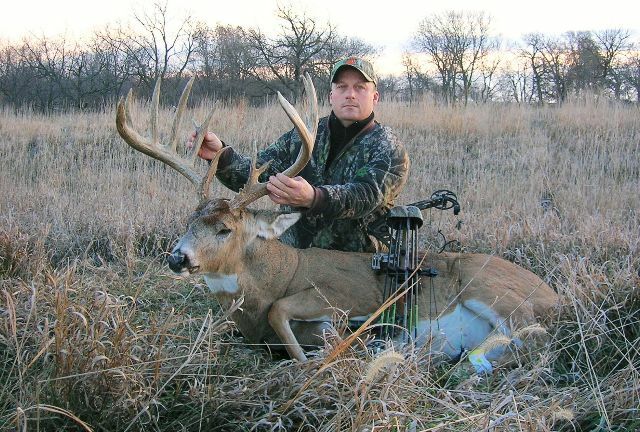 Patience, restraint on some smaller bucks and a natural knack for whitetail hunting produced Tony's first deer with a bow, a Mathews. On November 4th we went to a new stand around 2 pm and we didn’t see a single deer for the first two hours. Suddenly we saw 2 does running across the open bean field towards us but they ended up heading into a big pocket of timber roughly 200 yards away. After that we waited about a half hour, then we saw 2 more does and one small buck dogging them all over the place. Then about 5 pm dad saw 2 more does acting weird so he told me to get my bow ready. So I did and about 1 minute after that sure enough here came the buck. Dad kept moving the can in different directions and got the buck to come right in to my 25 yard shooting lane. When he got there, Dad grunted at him, and stopped him. I let him have it and he ran 50 yards, looked back, and then tipped over dead. After that we went and followed his blood trail, then we saw him lying there and I got really exited. Then we went home and showed him to my family. 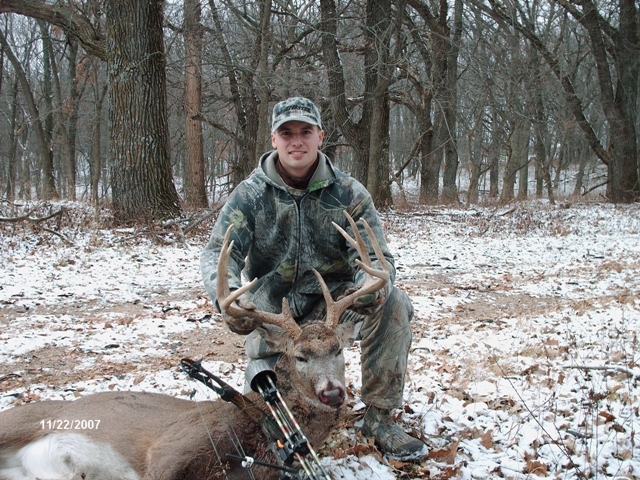 I harvested this buck with my new Mathews Ignition bow, which I had just purchased only two days before this hunt. I’m using Beman Camo Hunter ICS 500 carbon arrows and 75 grain three blade Muzzy broad heads. My shot placement was a perfect according to my Dad and Grandpa. The shot ended up double lunging the buck with a quartering towards me shot. 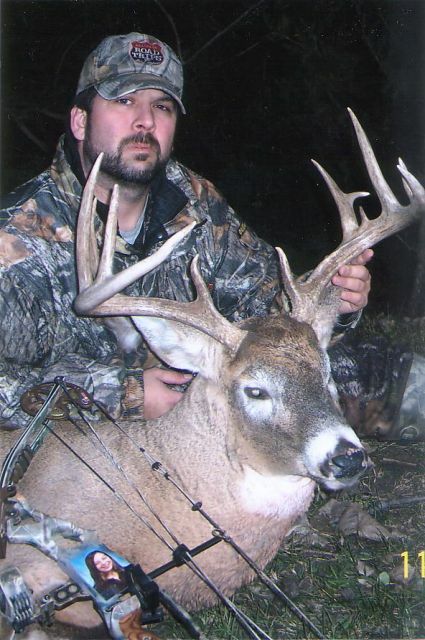 I can hardly wait until next October, to get back into the woods to harvest another great white-tailed buck. I’m still hunting with my Dad, trying to fill my doe tag. I shot this nice 12 pointer on the 10th. It was a loud windy night. Didn't see the buck till he was at 20yds. I waited till he passed below me and then stood up and shot @12yds. He ran 40yds. nose dove into a log and flipped over and came to a rest. What an awesome Thanksgiving morning hunt! 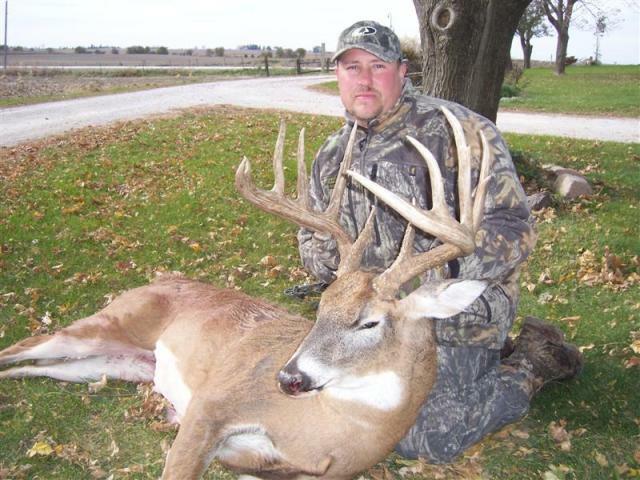 This is why whitetail enthusiasts want to live in Iowa. Congrat's from Prairie Images. 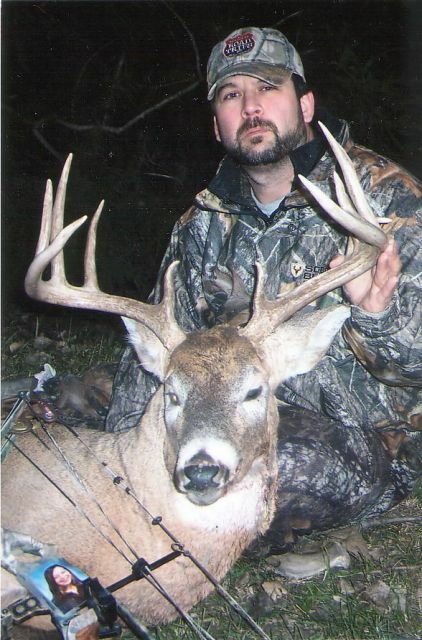 I shot this buck on November 18th. 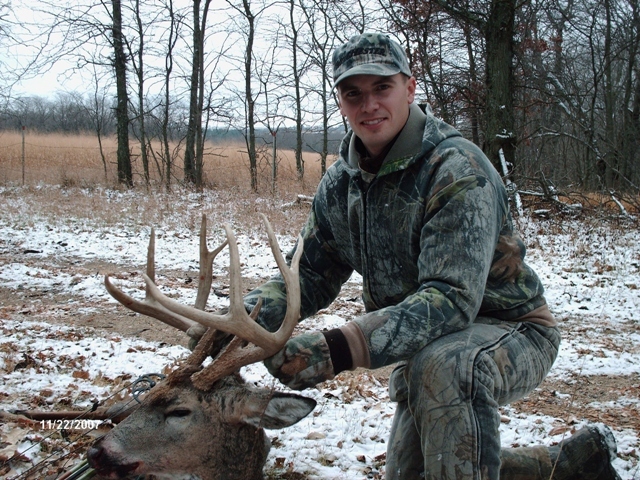 He wasn't the buck I had been hunting, but it was a great hunt and I am very happy with him. There was a smaller 8 and a doe below me at about 15 yards for about a half hour. I heard this buck from a long way out working on some trees making all sorts of noise. I grunted a couple of times and then I could hear him running right at me! He stopped just perfect at 10 yards. The shot was good and he only went about 15 yards, I saw him lay down! Now it's time to get out the shotgun! Hi my name is Alex Golay. I'm 15. 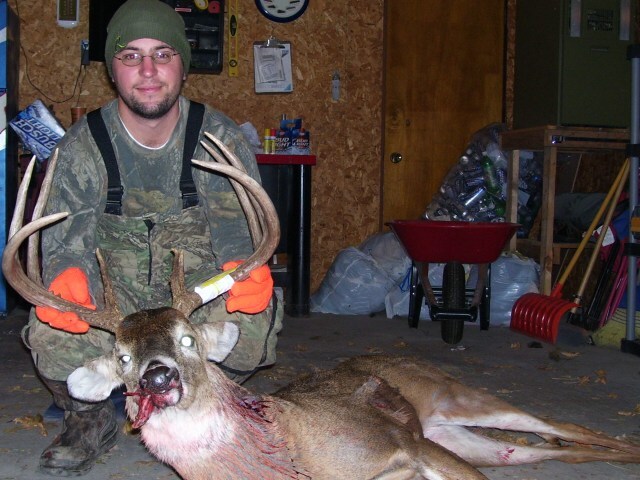 I shot this 10 pointer the morning after Thanksgiving which would be the 23rd. He's a main frame 10 that scores 165 4/8. I used my Bushnell Elite rangefinder to find out that he was 21 yards away when I shot with my Browning bow. I had him on my video camera before season several times and I knew he was a shooter. First deer using a release. First deer in a long time from a tree stand. 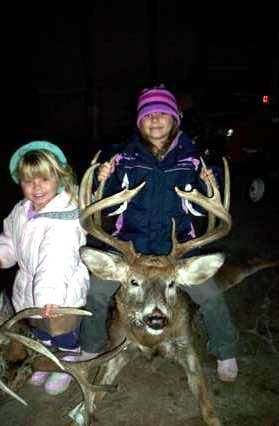 Good opportunity for daughter Morgan to follow her first blood trail. It made for a long night but well worth the effort. 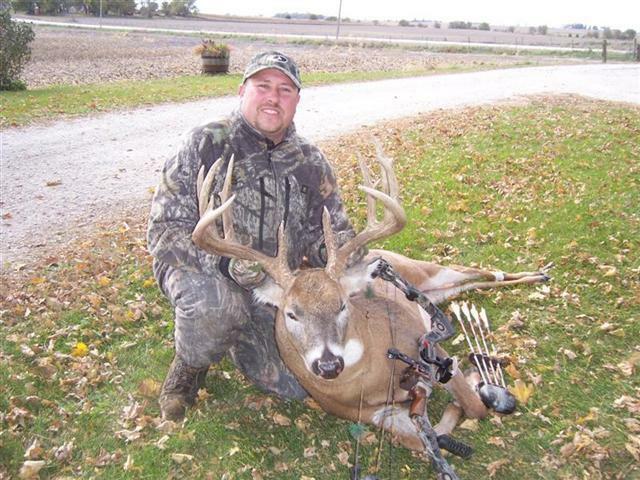 Equipment: Hoyt Protec, Beman 340 ICS Hunters, G5 Montec Broadhead, Tru-Fire Bulldog Release, Black Gold Flashpoint Sight. Shot at 25 paces. Recovery distance approximately 150 yards. 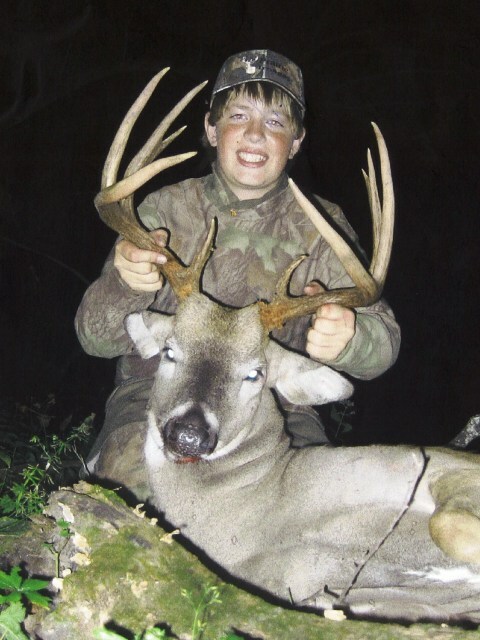 I shot this deer with a cross bow. Thought you might want to post the picture. It is an 11 point. I used a grunt call and snort-wheeze to call this buck to 20 yards. I was using a decoy at the time. I took the shot from my knees in a brush pile.